Hannah was a excellent wild bird and NSTRA trial dog. 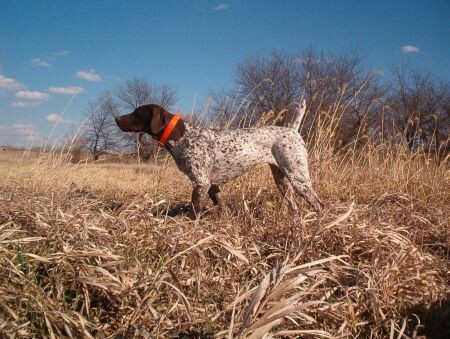 She earned her first championship after running NSTRA just 14 months. In 2006 she was the first runner up for high points in the Midwest Region, she won the Midwest Regional Trial Championship and at her first National trial, she brought home a third and second place from the first two days. On the final day of the Grand National she beat two other dogs and a National Trial Champion. She ended up third runner-up, only to be beaten by the dog that finished first runner-up. Hannah put on her second Championship and continued to place in trials no matter what state she was in. Hannah finished in the top 16 a the 2008 Grand Nationals. Hannah was an excellent family dog. She was a real personable dog. She had a excellent nose, lots of style and could run with any pointer in the game. Thank you for all the good tines. 3/24/02 to 12/13/09. Click on Hannah's picture to see her pedigree.